Google today announced that it has expanded its recently launched Cloud Platform region in the Netherlands with an additional zone. The investment, which is worth a reported 500 million euros, expands the existing Netherlands region from two to three regions. With this, all the four central European Google Cloud Platform zones now feature three zones (which are akin to what AWS would call “availability zones”) that allow developers to build highly available services across multiple data centers. Google typically aims to have a least three zones in every region, so today’s announcement to expand its region in the Dutch province of Groningen doesn’t come as a major surprise. 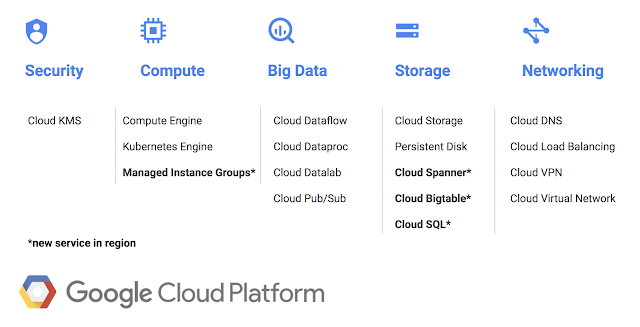 With this move, Google is also making Cloud Spanner, Cloud Bigtable, Managed Instance Groups, and Cloud SQL available in the region. Over the course of the last two years, Google has worked hard to expand its global data center footprint. While it still can’t compete with the likes of AWS and Azure, which currently offers more regions than any of its competitors, the company now has enough of a presence to be competitive in most markets. In the near future, Google also plans to open regions in Los Angeles, Finland, Osaka and Hong Kong. The major blank spots on its current map remain Africa, China (for rather obvious reasons) and Eastern Europe, including Russia. Posted in Software Development and tagged Cloud, data center, Enterprise, Europe, Google, Netherlands, TC.